Rasor industrial round knife cloth cutting machine fitted with 120mm (4.72") blade and carbide counter blade for scissor like precision cutting. 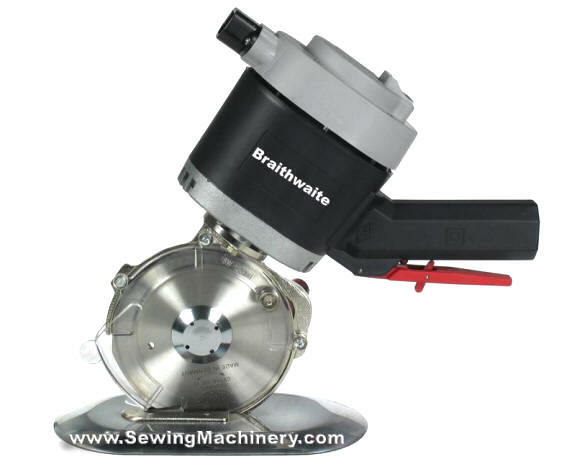 This versatile cutting machine is mounted on a low friction roller bearing base for use with many materials including: cloth, leather, polymer sheeting, insulation, padding, neoprene sheets, filters, synthetic fibres, upholstery etc. A multipurpose round blade, made from high speed steel, has eight cutting edges which are always in contact with the counter blade (an optional fully round blade is available for very light materials). In order to prevent accidental starts, a red safety handle is fitted. The trigger on the handle must be pushed before the handle will operate and a separate on/off switch is fitted on top of machine. 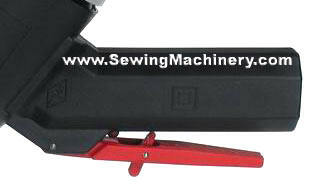 Releasing the red safety handle immediately cuts power to the motor. Rasor machines are manufactured in Europe so you can be assured they meet with the relevant EC machinery safety directives and the applied CE mark actually means something (unlike some copy machines).